Existing diesel particulate filters for heavy duty diesel engines have relatively low soot oxidation rates, which have prevented them from being used as emission reduction in many applications. CCT (Catalytic Combustion Technology) developed by STT Emtec uses diesel fuel from the vehicle injected into the exhaust stream causing exothermic reaction in the catalyst upstream of the filter. The released heat increases temperature of the particulate filter, promoting oxidation of soot collected in the filter media. Using this emission system, makes it possible to retrofit vehicles already equipped with passive particulate filters as well as new vehicles previously not suitable for use with passive particulate filters. The system is suitable for all types of heavy-duty applications where passive filters have failed to work due to difficult duty cycle with regards to, among others, low exhaust gas temperature. 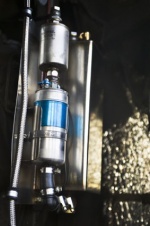 The CCT system guarantees that the filter is regenerated as often as needed. This CCT system ensures required soot oxidation rate for reliable filter regeneration during normal operational conditions for every application. The system contains a fuel delivery system, injection manifold and dosing nozzle, controlled by a stand-alone electronic control unit. The amount of fuel needed for every operational condition is determined by the exhaust gas flow rate and temperature increase needed. Heat is generated in the catalyst during the flameless exothermic reaction between oxygen and fuel. The catalyst is an efficient heat exchanger and the heat generated during the initial 30 seconds of regeneration will be absorbed by the catalyst. 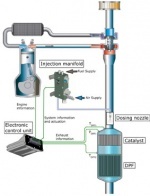 Once the catalyst is hot, the DPF starts to warm up and soot will start to oxidize. As the exhaust gas temperature reaches 600°C (1 110° F) the reaction between soot and oxygen starts. The oxidation rate increases rapidly with temperature and at 650°C (1 200° F) a complete regeneration of the DPF will take approximately five minutes. This means that a small amount of fuel is consumed during the regeneration event. Depending on duty cycle and operational conditions the time between regenerations will differ, which affect the fuel consumption of the system. Practical experience shows low increase in fuel consumption and in any case less than one percent in most applications. Open presentation: Development of an Active Regeneration System Based on Catalytic Combustion in PDF-format.